We stand behind everything we sell. Period. No Shorting. No Skimping. No Games. No Garbage. Just trash bags you can rely on. 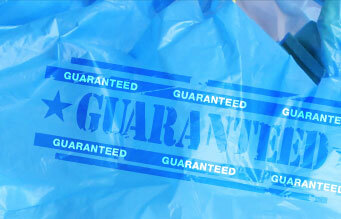 We are confident that you will be satisfied with every trash bag that leaves our warehouse. That’s why we offer a 100% satisfaction guarantee on every order. That means, in the event you are not 100% satisfied with your purchase, for whatever reason, we will work with your individual concerns until you are. Or you can return your purchase for a replacement or complete refund within 30 days, no questions asked. You won’t even need a receipt; we will have a record of your purchase. Read more about our easy Returns & Exchange Policy. We have been servicing businesses and households like yours since 1980. In that time we have learned a lot about which bags stand up to quality control and about the way our customers want to be treated. So, you can be sure your experience at Plastic Place will be worry-free; our bags and liners are reliable and our customer service exceptional. Guaranteed 100%. For any questions, contact us at info@plasticplace.com or call us at 877-343-BAGS (2247).